Josiah Wedgwood was a famous manufacturer of porcelain and earthenware. While many of his earlier works prior to 1781 may be unmarked, Josiah was the first potter of note to mark his wares with his own name, at a time when other potters were using easily forged marks such as the Sevres double L mark, the Meissen crossed swords mark, or the Chelsea Potteries anchor Mark. The Wedgwood marks have gone through several iterations over the years, as the company struck up partnership deals, relocated its production sites, and when the introduction of new trade laws were implemented. It should be noted however, that if the term “& CO” is present, this product is not part of the Wedgwood Collection. These products are in fact part of the 1790-1801 Enoch Wedgwood collections or part of the Knottingley Pottery collection. Starting in 1759 and up until 1769. Josiah began marking his wears with impressions made by using movable type printers. Earlier variations had each letter individually impressed, resulting in misplaced or uneven layouts. As he improved his technique, the impression mark took on a curved appearance. Josiah and his cousin, Thomas Wedgwood, went into partnerships with one another in 1769 to produce a collection of useful wares. This mark was made using a slug to create the impression, and would be reused in 1781. Where it can be found on both useful and decorative pieces alike. In 1769 Josiah Wedgwood started producing decorative wares in partnership with his good friend Thomas Bentley. These wares would have one of the three circular marks shown here. The marks were either impressed or raised from the body, with the impressed versions being the rarest form of these marks. An extremely rare mark that was used on ornamental wares that were produced between 1769 and 1780. Found on smaller seals, cameos and intaglios. These marks were the more simplistic marks that were impressed on decorative pieces produced during the Wedgwood and Bentley partnership. The Wedgwood & Bentley catalog number for a piece may have also been impressed on some wears, as indicated by the number 356. Following the death of Josiah’s business partner Thomas Bentley in 1781. The mark used on their decorative collections would be changed to the same as their useful wares collections. They would introduce all lower case, both upper and lower case, as well as the all upper case impressions. These marks will remain in use for a short time following Josiah death in 1795. This mark came about by an apparent change in the company or a new partnership. 1805, may be the date that the design was first registered, and may have either 2nd Feb or Feb 2 included in the date stamp. Printed in either, red, blue or gold. This mark is found upon the underside of bone china or porcelain that has been made between 1812 and 1828. These marks, of varying size, can be found on high quality products that were produced during a short period of time following the 1840’s. Early designs of this mark did not include the three stars located underneath the vase. After 1900 the three stars were included in the design. These marks can be found in various colors including red, blue and gold. Following the introduction of new U.S. customs regulations in 1891. 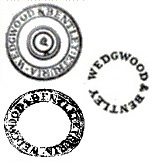 All existing Wedgwood marks that were still in use. Were updated to include either “England” or “Made In England” as part of their designs. This color printed mark can be found on their creamwares and Queens ware collections. The ® denotes the registering of the brand name. This machine printed mark is used today on bone china. It may also include the pattern name or number specific to piece it can be found on. 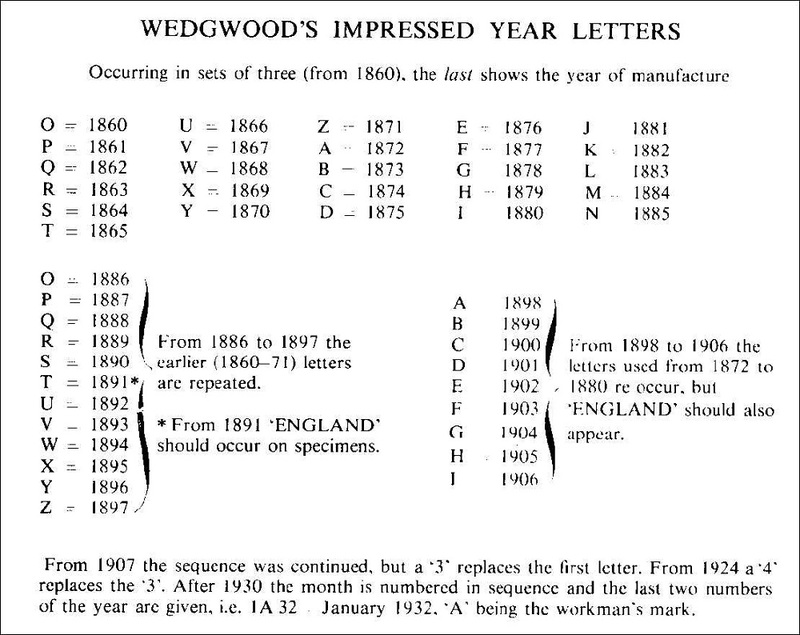 All Wedgwood wares include the three letter code that indicates its year of production. Below is a table that indicates which year each letter represents. These letters are reused between 1886 to 1897, with “ENGLAND” appearing besides the letters starting in 1891.